With the advent of smartphones, nearly everyone has a digital camera at their disposal 24/7. And artists and photographers are increasingly using these devices combined with social media as a new tool of expression. Double Vision: Artists Who Instagram, on view Feb. 7 through March 9, 2019 at The Teaching Gallery at Hudson Valley Community College, pairs the studio work of 11 artists with photographs they’ve shared on Instagram, inviting viewers to find connections between the two. The exhibition, curated by New York City-based artists Janice Caswell and Erick Johnson, is an expanded and updated version of one mounted in September 2017 at LABspace in Hillsdale, NY. Caswell and Johnson, both active Instagram users whose work is included in Double Vision, and several of the other exhibiting artists will discuss the exhibit on Thursday, Feb. 7 from 3 to 4 p.m. in the Bulmer Telecommunications Center Auditorium. A reception follows from 4 to 6 p.m. in The Teaching Gallery, located in the Administration Building on the Troy campus. Both events are free and open to the public. “Double Vision” investigates the sometimes blurred line between studio and street. When the artist leaves the studio, what do they “see” and what do they photograph? Is it an extension of their vision, a corollary practice, or something in between? How do the two feed each other? By offering instant options to edit, display, share and store images, the smartphone has changed how we interact with what we see. As the curators’ awareness grew of the many other artists using Instagram, it was apparent that the photos seem directly connected to the art made in the studio, though none of the artists had yet presented these photographs as their primary art form. In addition to Caswell and Johnson, Double Vision: Artists Who Instagram features work by Rosaire Appel, Joan Grubin, Mary Lum, Tom Martinelli, Doreen McCarthy, Tom Nicol, Chris Sauter, Karen Schifano and Karen Schiff. 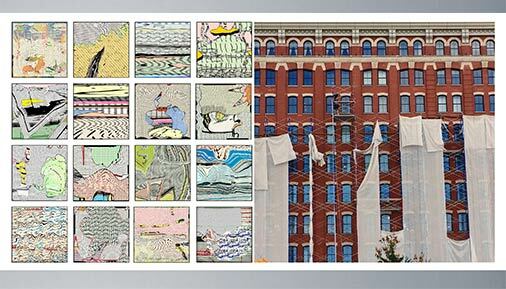 Artist/curator Janice Caswell’s work includes constructions and mixed-media drawings. Her numerous museum and gallery exhibitions include the Bronx Museum of the Arts, Savannah College of Art and Design, Galerie Anne Barault (Paris), and ArtPace (San Antonio). In 2017, she received an Arts and Letters award and a purchase prize by the American Academy of Arts and Letters. She was a fellow at The Dora Maar House (Ménerbes, France), Yaddo (Saratoga Springs) and Virginia Center for the Creative Arts. Caswell holds a BFA from the School of Visual Arts in New York City. Artist/curator Erick Johnson has exhibited his work nationally and internationally, and earned critical recognition for his solo shows in New York and Washington, DC, where he is represented by Gallery Neptune & Brown. He studied at the School of Visual Arts and received an MFA from the Milton Avery Graduate School for the Arts at Bard College.